MAKE-UP artist Courtney Leigh Hollins is one step closer to being the “girl from Dawesville” who took out a national make-up artistry competition. Her grand final video for the American makeup label NYX Cosmetics #FaceAwards went live on Wednesday. 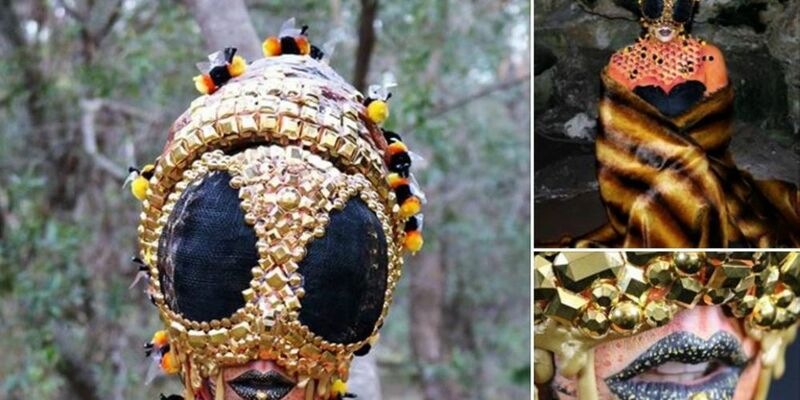 Ms Hollins’ latest video sees her transform from Queen Bee to actual bee. The freelance businesswoman landed in Melbourne today and will face a judging panel. She still needs her supporters to vote for her at the NYX website in order to take out the competition. Courtney before she creates her fantasy looks. Ms Hollins told the Coastal Times last month she was shocked she made it to the finals. “The other contestants have a larger social media following,” she said. Ms Hollins started painting her “artsy” creations about two-and-a-half-years-ago. She has a diploma in specialist makeup and but discovered her artistic talents at the age of four. Ms Hollins had to win three heats to make it to the finals. The first heat saw her create Storm from X-Men, the second was Immortan Joe from Mad Max and the third a dreaming in candy theme. The looks had to be created using NYX products. Ms Hollins is the only WA contestant to make it to the finals. The winner will be decided by a judging panel and through voting, then announced on July 8. “It will be amazing if a girl from Dawesville takes it out,” she said.